When it comes to newspaper production, we're experts at page layout and design, print production and web design. 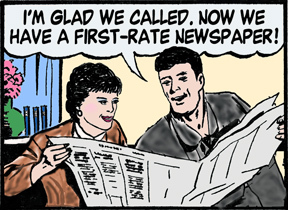 Print publications can be made on a variety of newspaper stocks - from basic newsprint to high-quality white offset. Websites can be simple or complex, based on your requirements and the needs of your visitors. Full-color printing has first-class impact with maximum reader appeal. Media Trends offers quality, full-color printing and fast turnaround times. Spot color costs less than full color printing, and if used properly, can still provide the visual impact you're looking for. Black-ink printing is the most economical way to print your newspaper. Fast turnaround and low prices make these newspapers the choice of many schools and organizations. Are you struggling to put together a curriculum guide or district bulletin in Microsoft Word? Our page layout and design services can smooth the process along. Media Trends will take your publication from text to mailing house in a week. Newsletters can keep your important audiences informed. Media Trends will design and produce a timely, professional publication that will keep your audiences engaged and impressed as well. Media Trends creates page layouts quickly and accurately. We use journalistic standards in designing your pages, so your newspaper will look as professional as the local daily news. Media Trends' professional page layout and printing service allows your staff to concentrate on writing and editing the paper. Our Adjust and Fit service gives you the flexibility to do your own page layout AND speed up your production process. We offer high-quality tabloid and broadsheet printing at competitive prices. Fast turnaround time, too! Media Trends specializes in newspaper design and layout. This service can be paired with our printing services or purchased separately. Well-written copy is the most important part of any publication. Our experienced copy editors can improve your message in print or online. Customized training and workshops at your location and scheduled for your convenience. Our web designers create websites that will attract readers and build your business. Speak with one of our experts today to design a website that works for you!